If you had to list your favorite Christmas food, what would they be? I’d have too many to list since I have quite a few favorites, but up near the top would be Buñelos Dågu. 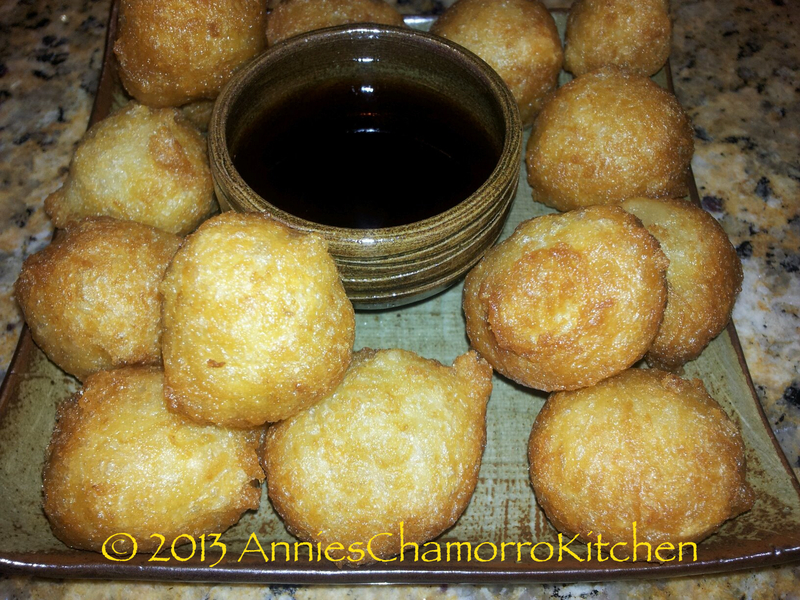 A delicious treat, these fried yam donuts, or Buñelos Dågu in Chamorro, are synonymous with Christmas. This is perhaps because the yams are harvested during the Christmas season. There are several varieties of yams that you can use to make these donuts. If you live on Guam or the other Mariana Islands, you can use Dågu, Nika, or Gadu’. There are also both White and Red varieties of Dågu (called Dågun Å’paka’ or Dågun Agaga’, respectively). Donuts made with dågu tend to be brownish in color after frying. 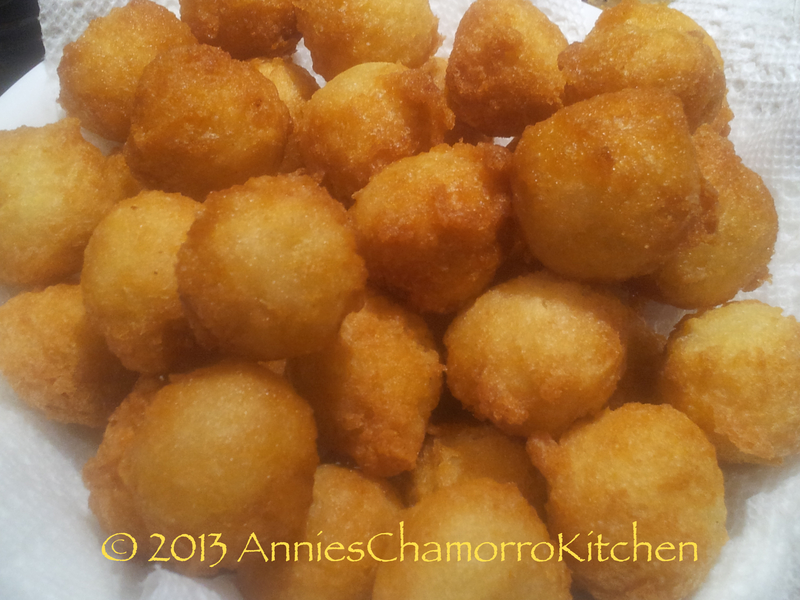 Nika donuts are much lighter, a golden brown on the outside and creamy white in color on the inside. While I like both types, I prefer Nika donuts. Living in the states, I found a great substitute for the white yams we know on Guam as Nika. It’s called Nahme (pronounced nah-may) Root in some Asian Stores. I’ve even seen it called Namee or Nami. If your local Asian market doesn’t have it, check the Hispanic stores, or ask the store manager to order some for you. This is what Nahme looks like. If you’re lucky, you can find some dågu as well. They are quite large, and look like monstrous hands with lots of “fingers”. Here’s a photo of dågu. Aside from making donuts with the yams, you can cook them as you would potatoes. Yams are delicious cooked in a chicken stew or kådu with coconut milk. 1. Heat oil in a frying pan; the oil should come to about 1 inch in depth. 2. Peel skin off the yam. Using the fine part of a box or hand­held grater, grate the yam into a mixing bowl. When grating the yam, your skin might be mildly irritated. The scientific explanation for this is that most yams contain oxalate crystals which can irritate the skin, mouth and sometimes tongue. I get around this by wearing plastic gloves when I grate the yams. 3. Mix in the flour, sugar, and baking powder. 4. 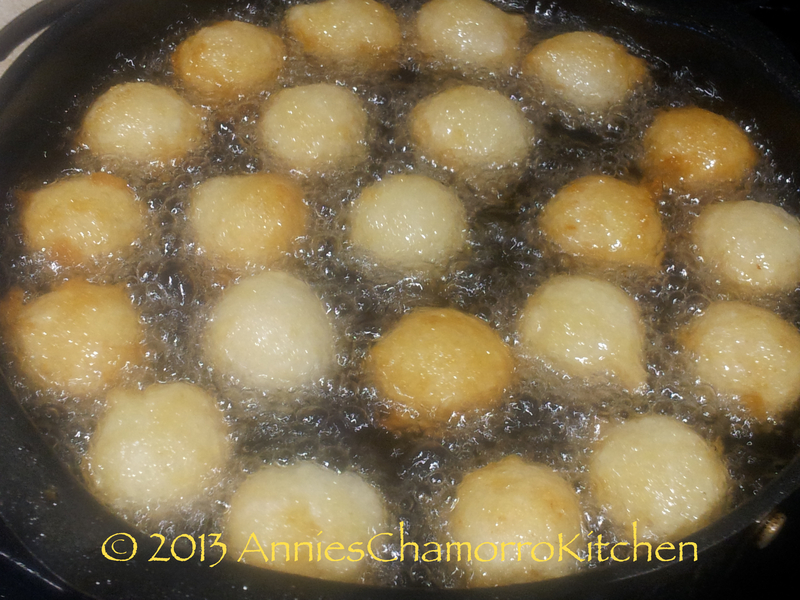 Drop batter by heaping tablespoonful into the hot oil. Fry until golden brown, turning frequently to ensure even browning on all sides. Modern conveniences make it so easy to drop the batter into the oil. Back home on Guam, we’d scoop up a handful of batter then squeeze out dollops between our thumb and pointer. It sounds difficult, but it’s actually quite easy to squeeze it out from between your fingers. It just takes practice. If you can’t get the hang of forming them this way, use a small ice cream scoop (the 1-tablespoon sized scoop). Dip the scoop in water then scoop out some batter; the batter will slide right out and not stick to the scoop. 5. Serve with maple syrup or a simple syrup. To make a simple syrup: in a microwave safe cup or bowl, mix together 1 cup of sugar with 1/4 cup water. Microwave on high until the sugar is melted. Stir thoroughly. Let the syrup cool slightly before using. Awesome recipe… Ive used your recipe numerous times and it always comes out perfect. I substituted the Yam for banana— it was scrumptious! Si Yu’us Ma’ase! Glad to hear it! Thanks…and you’re welcome. Thank you for sharing. Can’t find dagu or nika here so have had to use sweet potato or yam. So adding coconut or evaporated milk isn’t necessary? I’ve never used coconut milk in my donuts. Evaporated milk either. 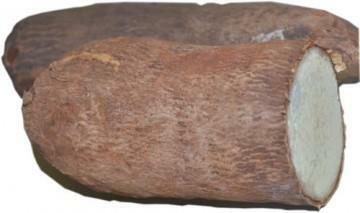 You can also look for Japanese Mountain Yam. I live in Las Vegas and it is sold all year round. Can we use the frozen yam??? Yes, just make sure to thaw it out completely and squeeze out the excess water. In researching many Chamorro recipes online, I came across yours and the authenticity of your ingredience is what caught my attention. So many ingredience out there is either missing something or left out. Thank- you for making these Chamorro recipes available for all of us to enjoy,share and teach the next generation. 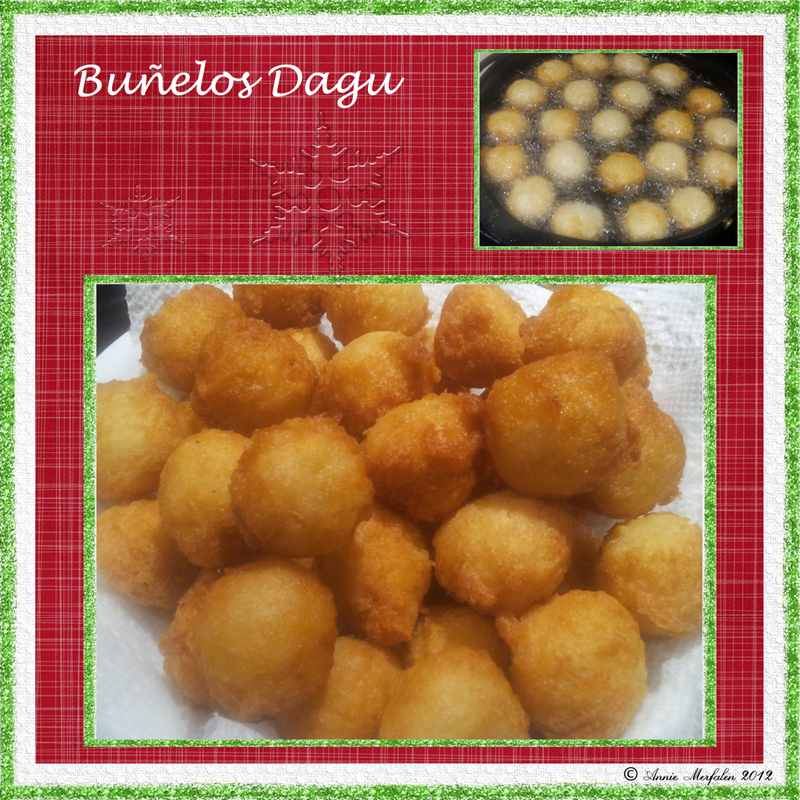 I tried your recipe with dagun haja and the bunelos came out perfect. My haole husband had some for the first time and liked them! They were white on the inside and they did not get tough. I think the secret is to not over mix the batter because the gluten in the flour will develop and make the bunelos tough. Mix just until the flour is incorporated. Thanks for making my first attempt a roaring success. Thanks also for the reminder tip about not over mixing the batter and gluten development. Happy New Year! Oh Goodness! I could not see the recipe categories on my iPhone clear enough! Now I got the recipe on my desk top! Thank you so much again for this recipe board! It really does bring me so much Joy and Comfort of memories of family and home growing up in Guam! Cheers! Thanks, Annie. My sister made some this morning in CA and I would like to try it myself. It has been over 50 years and your recipe brings back memories. Si Yuus Maase! You’re too awesome Mali! After reading this, I actually think I can do this! I’m gonna check the stores tomorrow. Thank you for sharing! Thanks Annie! It has been about 30 years since I have tried this so I’ll give your recipe a shot this holiday season and let you know. You’re welcome, Jesse, and thanks for trying out my recipe. Please do let me know how it turns out.